Matsuyama is a city located on the western side of Shikoku. It is, by some standards, considered the largest city on Shikoku, but this is debated with the city of Takamatsu. The city itself has a very small feel, yet has enough shops to keep city folk happy. It is also an excellent place to see different things at a somewhat relaxed pace. You’ll be able to see a castle, onsen, parks, and temples, all in one city. If you don’t have a lot of time, Matsuyama is a great place to see everything in a couple of days. The heart of Matsuyama has to be the castle. Matsuyama-jo is located on Mount Katsuyama. This is a relatively small mountain that provides a nice getaway from the city itself. There are about four different routes to climb Katsuyama to reach Matsuyama-jo. Heading to the east side of the mountain is by far the easiest way to get to the top. You can ride the gondola, or take the chairlift. Both take roughly the same amount of time to reach the top. The chairlift is a single chair that slowly climbs the mountain. It is a very Japanese style of moving people. It is very peaceful, providing beautiful views of the city as you climb the side of the mountain. Riding the gondola is better if you have many small children with you. The gondola is usually packed, so the view depends on where you are inside the car. At the top of the gondola station, you’ll be greeted by many shop keepers trying to entice you to buy one of the citrus fruit drinks and bring a bottle home with you. It is a nice refreshing drink, especially if you decide to hike up the mountain, but a little expensive. Depending on the day you visit the castle, you might also find a few activities in the outer courtyard. On the day I visited, there were opportunities to dress up in period clothing, such as a samurai, or in an old style kimono. The castle itself is a well preserved original. 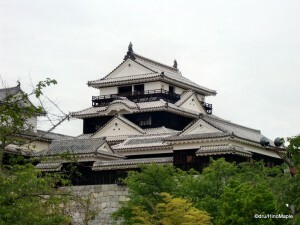 As I mentioned before, Shikoku has many wonderful and original, castles, unlike Honshu, the main island. This one is no exception. Upon paying the entrance fee, you will have a great opportunity to have spectacular views of the city. The inside of the castle is extremely busy. You must remove your shoes and wear slippers as you walk through the castle. Unlike Kochi-jo, there isn’t much to see or do in this castle. It is too busy to place dioramas, so you can only enjoy the original architecture and views from inside the castle. It was amazing to see the Japanese people lining up in a very orderly fashion to leave the main tower of the castle. If you have the energy, I would also recommend hiking down the mountain and taking a look at a shrine located halfway up the gondola. If you head to the south side of the mountain, you can also visit Bansuiso. It is a French style villa that is now part of an art gallery. Unfortunately, I didn’t visit this gallery, but if I do return to Matsuyama, I will. Matsuyama has two stations named Matsuyama, JR Matsuyama and Matsuyama-shi. When you travel to Matsuyama, it is important to know which one you are at. JR Matsuyama is a nice station, but it is highly focused on travellers only. There are very few things to do around the station itself. Located a fair walk west of the station is Matsuyama Central Park. It is a more secluded park that is probably used by locals rather than everyday tourists. It does have its own “castle”, but it is modeled after European castle walls, rather than Japanese style castles. 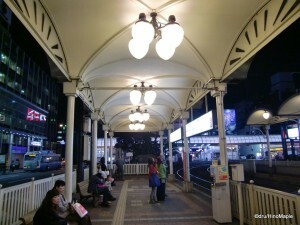 Matsuyama-shi station is more interesting. It is the start of Matsuyama’s long shopping arcade. As I have said, countless times, shopping arcades in Japan tend to look and feel the same. Matsuyama’s shopping arcade is no different. It is definitely worth a visit as it is somewhat unique. I would probably take a quick look through the arcade, but focus more on the area just below Matsuyma-jo. Around the gondola, you will be able to enjoy a more touristy and local experience. This is also the location of the Matsuyama Guesthouse. Matsuyama Guesthouse was my home for one night. As a tourist on a budget, hostels are a great way to save money. Although the sign says it’s a guesthouse, you can also rent rooms for one night. The day I arrived, the hostel filled up completely. There were two long term guests. One was a New Yorker who had lived in China for a couple years. He was just starting out in Japan, and decided Matsuyama would be his base. There were also a couple of American hikers who were hiking all around Shikoku, but had to stop and return to Tokyo as they needed to get back to work. An older Australian couple also came by. They shared their stories of travelling throughout Japan and how they were going to another country, maybe Korea, to visit their son. I also got to meet a Dutch “kid” who just finished High School and wanted to spend his GAP year in Japan. At night, they had a special party for either Kids Day or Green Day. In May, Japan has Golden Week, 5 consecutive days off, including the weekend. With so many new guests, I guess we had to party. We had some homemade okonomiyaki, cold sake, and some umeshu. It was a wonderful time, but unfortunately, I couldn’t stay more than one night. They were fully booked the next night. The host of the hostel is very friendly and very kind. Her English may not be perfect, but she tries so hard and she is always smiling. 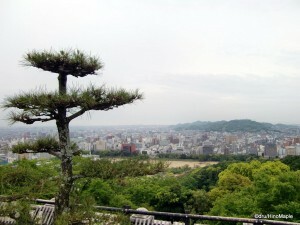 Overall, Matsuyama is a wonderful city that is a must visit if you go to Shikoku. While in Matsuyama, I would also recommend heading over to Dogo. It is a very short tram ride, and I’ll talk about that next week. 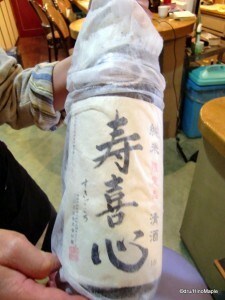 Please feel free to visit Guesthouse Matsuyama and read their blog. Unfortunately, their blog is only in Japanese, but the pictures are always nice. This entry was posted in Shikoku and tagged America, American, Australia, Australian, Bansuiso, castle, chairlift, China, citrus fruit, cold sake, diorama, Dogo, Dutch, GAP year, golden week, gondola, Green Day, Guesthouse, Guesthouse Matsuyama, Holland, hostel, Iyo, japan, JR Matsuyama, Katsuyama, Kid's Day, kimono, Kochi Castle, Kochi-jo, Korea, Matsuyama, Matsuyama Castle, Matsuyama Central Park, Matsuyama Guesthouse, Matsuyama-jo, Matsuyama-shi, Matsuyamashi, Matsuyamashi Mae, Mt. Katsu, Mt. Katsuyama, Neatherlands, New Yorker, nihonshu, Okonomiyaki, onsen, park, sake, samurai, Shikoku, shopping arcade, shotengai, shrine, temple, tokyo, Youth Hostel, おんせん, かつやま, どご, 中国, 土語温泉, 日本酒, 東京, 松山, 温泉, 酒, 韓国, 高知, 高知城 by Dru. Bookmark the permalink.